It is the mission of Curie Metropolitan High School to offer a rigorous academic curriculum with an emphasis on technology and the arts. 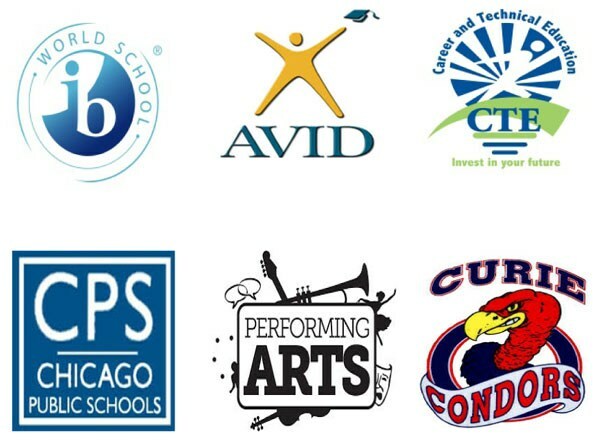 Curie High School promotes future success by establishing a culture of college and career readiness and by encouraging students to enroll in post-secondary institutions. Curie High School is committed to providing authentic learning experiences that will provide a foundation for life-long learning. Students will be prepared to become leaders and engaged citizens in a global society, enabling them to contribute positively and responsibly to their community. If we promote college and career readiness through targeted instruction, enhance MTSS best practice strategies, provide targeted professional development aligned with REACH Framework, foster a culture of lifelong learning through the Curie’s programs and engage and support parents through outreach resources, then we will impact the instructional core by embedding CRS and CCSS skills in the curriculum. We will implement instructional and classroom strategies and we will increase parent and community involvement to support students’ academic efforts, as well as school programs. Staff will promote college and career readiness for all students through targeted instruction. Staff will enhance MTSS (Multi-Tiered System of Supports) best practice strategies that support socio-emotional and academic success for all students. Provide targeted professional development aligned with REACH Framework to refine skills and strengthen teacher practices. Foster a culture of lifelong learning by continuing to deliver an enriched high school experience for all Curie students through persistent support and growth of the school’s CTE, IB, AVID, and Fine and Performing Arts. Support students holistically by engaging and supporting their parents through outreach resource. To have our school organized based on the 5 essential components, have consistent student growth on EPAS assessments for each priority group, 68% of students enroll in College and have an 80% graduation rate.